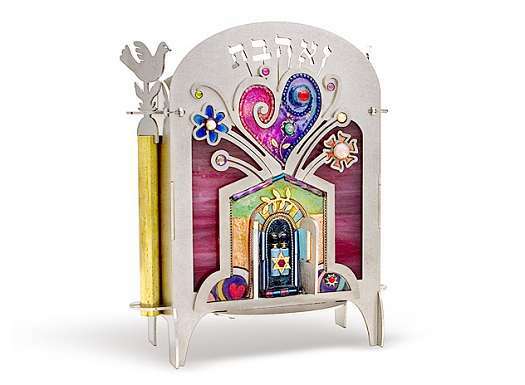 Under the word “V’Ahavta” (“And you shall love…” - Deuteronomy 6:4-9) is a Torah Ark bursting with a bouquet of flowers and vines and a big, expressive heart. Rose colored stained glass balances this dynamic image with a soft cloudy background. The Box is made by hand painting, followed by a variety of materials meticulously arranged inside the delicately cut stainless steel frame. The box parts are cut to perfectly fit and are assembled using no welding or glue resulting in a beautifully finished piece. The word Tzedakah is translated as Charity but the Hebrew word is actually derived from the root “Tzedek” or justice. Tzedakah is one of the important tenets of Judaism. Giving a Tzedakah box, especially when one becomes bar/bat mitzvah, conveys the notion of new, adult responsibilities.